Have you heard the news about Crocs? Things aren’t looking good for the company known for footwear that looks like a toddler’s beach toy. As told to Footwear News, they’re merely “winding down their owned manufacturing facilities” and “streamlining” their business to “innovate” and “shift production to third parties.” Take it from us in news media — these buzzwords don’t bode well for the future of anything. Dozens of Crocs fanatics were confused and scared, not knowing what the future held for ruining first impressions with their footwear. On Twitter, Crocs reassured fans it will survive the impending shoepocalypse. But it’s time we heard from the loyal shoppers themselves. We talked to everyone we could think of who still buys Crocs — a 4-year-old toddler, a 71-year-old senior, a bartender, a podiatrist, a nurse and a former Finish Line manager — about a grim, dystopian future without Crocs. These are their harrowing stories. The first thing is, I got a size-16 foot. So I put ’em in a lot of places I don’t need to, and the closed-toed Crocs help a lot as far as bangin’ up my nails and toes. Plus, crocs are comfortable. I’ve had my feet in flip flops — I hate ’em. I don’t like that cap in the middle. I don’t like the noise they make when you walk. I don’t like anything about flip-flops, and I’ve tried sandals, too. The only person sandals look good on is probably Jesus. I didn’t know they were closing plants. I wish they could keep them open. I don’t know if it’s this tariffs business that’s messin’ everything up. Will they keep the quality? I mean, jeez, I’ve had my pair of Crocs for probably eight to 10 years. They’re getting a little worn-out. I was planning on buying another pair, but, I mean, they last. And will they last with the new manufacturing specs? I’m kind of worried about that. Might buy a couple pairs and keep them in the closet. I should get on that. I’ve never been a fan of the look of Crocs. I wouldn’t say I’d wear them out in any public function other then work, but they’re extremely comfortable for long hours on your feet. Not to mention, they last a very long time in tough conditions. At work I really don’t care about fashion as much as durability. I’ve currently had the ones I wear for three years, and they’re still in good condition. They have some of the best tread for a non-slip shoe, and it doesn’t fade like other brands; there aren’t many elegant, slip-resistant shoes that you can buy for under $40, so I’d say they lead the pack in looks at that price point. In other words, if they’re closing a bunch of their factories that may cause them to be nonexistent, I’m going to buy 15 pairs right now because they are that good. Despite their utilitarian/barbarian appearance, Crocs Inc. was awarded the American Podiatric Medical Association Seal of Approval in 2008, and still gives a free pair of Crocs to every podiatry student. I’m therefore obligated to give my unrelenting support to said brand. According to a recent study, 52 percent of U.S. adults report that foot or ankle pathologies restrict their physical activity. As Crocs Inc. continues to metamorphosize, and inevitably take over Air Jordan as world’s most popular shoe brand, I expect this percentage to dip into the teens. Basically: Crocs aren’t going anywhere. They are the cockroaches of the footwear world. I do not and have never worn Crocs at work. A few people I work with do — some even without socks, which is kinda gross. They’re in a hospital, and because Crocs have holes in them, who knows what type of bodily fluid will drip through them and onto your feet. More nurses these days wear Danskos, which are basically more expensive Crocs without holes, and made out of a more supportive material. So if Crocs do completely go out of business, at least people will be forced to wear shoes without holes in them. 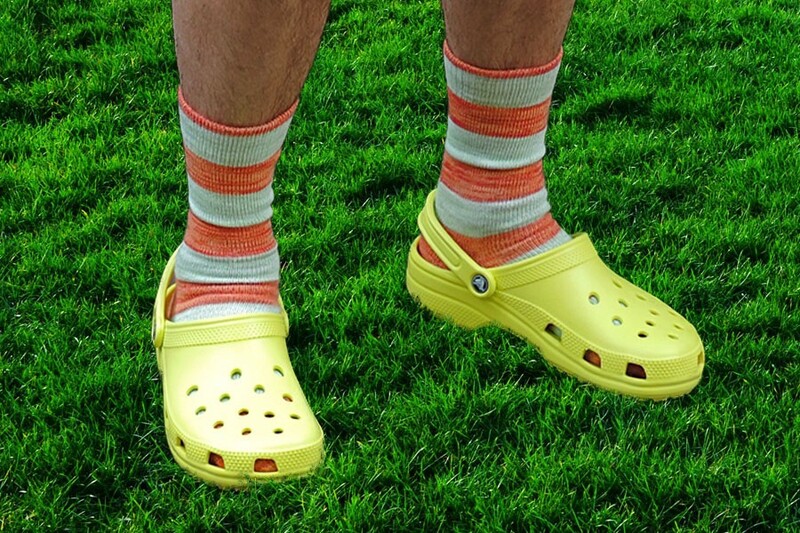 At the time I managed, the Croc craze was probably at its peak, and they were easily some of our best sellers. We had all sorts of styles and branded Crocs, which were huge, especially among tourists and children, maybe because they just seemed like a trend shoe, along the lines of Heelys. It’s no surprise to me then that the brand is fizzling out. They had a great run, but I don’t think the overall silhouette was one of longevity. Like, it’s definitely not one of versatility, especially when you think about the variety of weather types, particularly in the Midwest. Thank you for contacting us. Your story sounds funny, but I’m sorry, we won’t be able to participate.